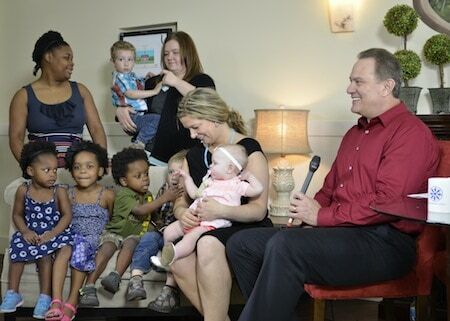 So, you remember that one time I was on ChicagonistaLIVE to promote The Gardner School? You don’t? Oh, well, then here’s your chance to redeem yourself, but this isn’t about me. Earlier this month (by the way – where the heck is May GOING?!) the houseful of littles and I jetted off to The Gardner School of Naperville to tour their building and immerse ourselves in everything school related. The kids had a blast, and I, in all of my education loving glory, was impressed. I love schools for the wee ones, and even the bigger ones, and The Gardner School fed into my need to feel like I was 3 feet tall again, and surrounded by wooden toys. For this particular visit, we were stationed in The Gardner School in Oak Brook, and we had the entire building to ourselves! Sir Twizzler loved that he was able to test out all of the cool gear before any other children arrived. The nice thing about this visit is that he was able to comfortably walk through the school with some sense of certainty since we had visited the Naperville location earlier. One of the things that The Gardner Schools pride themselves on is consistency. This way, if a child has to move to another location for The Gardner School, they can be fairly comfortable. We all know that change is hard, but if your school can look the same – for the most part – then doesn’t that help quite a bit? 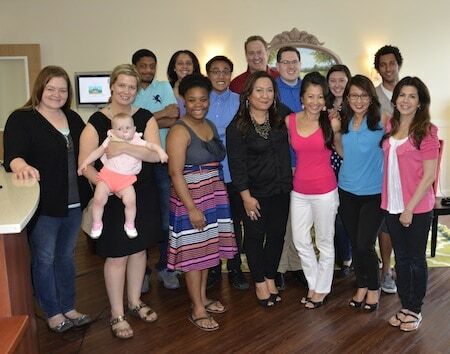 This time, during the visit, we were special guests of the ChicagonistaLIVE show. We discussed what we looked for in schools for our children, and our kids even got to say a few words to the tune of what their favorite foods were. My children ranged from MINE, to all types of fruit and mac n’ cheese. That garnered a few laughs even though I know that all answers were as serious as could be. As I said during our first trip, this school is fantastic. I’m not sure what’s happening to me in my older age, but I love seeing children in uniform, and SMILING, and having fun learning, and The Gardner School offers all three of these things EVERY DAY. It takes a special person to teach our children, and if you’re going to trust someone to do it besides you, why not choose where you know they’ll be loved. I mean, my children weren’t enrolled, and one of the lead teachers was SO patient as Sir Twizzler pulled her by the hand all over the place. It was endearing. I kind of want to go sneak back in just to hang out in the classrooms. Especially during art time. Or music. Or science. Because we all know that seeing things through a microscope is just too hot to trot. 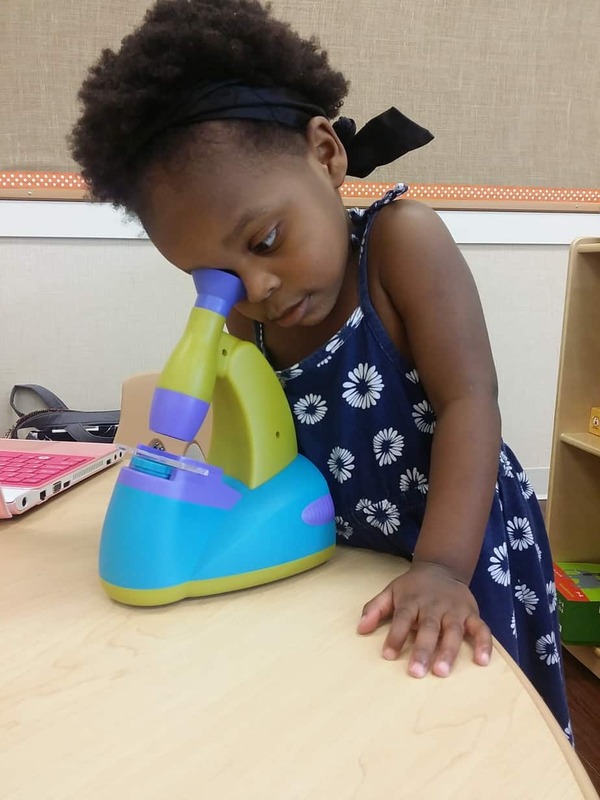 Lil Miss, got a kick out of looking at all types of bugs through this preK friendly microscope. We loved it so much that we ordered it for our own homeschool. I also secretly love that she has both eyes open while looking into the magnifying lens. It’s this type of stuff that makes you want to bottle children up and keep them forever. The lucky teachers at The Gardner School get to see it daily. AND, before you think to leave this page – you should check out the show that we were on! It’s chock full of great information about The Gardner School which has locations in other states, and nutrition – because it’s summertime, and you need to make sure that you’re getting everything you need in these hot months. I was compensated for this post from ChicagonistaLIVE, but all drooling, fascination with educational tools, and Houseful of Littles opinions are our own. As they should be.